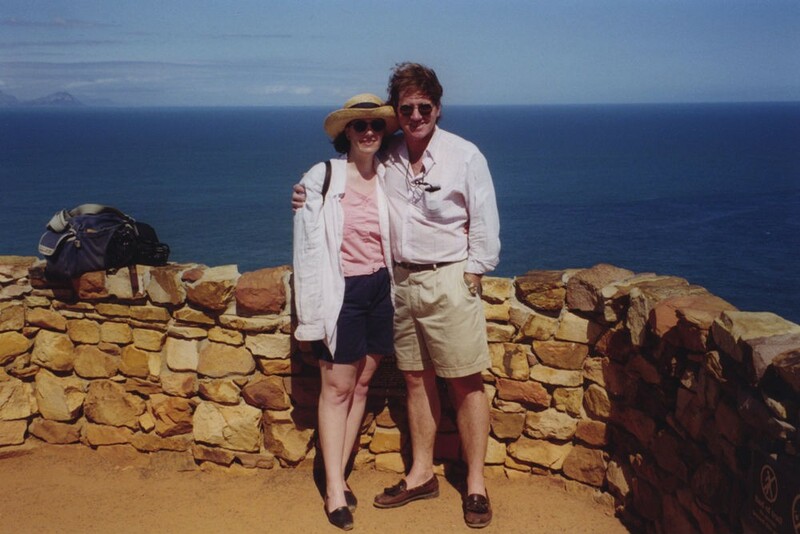 Tim and me on our first date—at the Cape of Good Hope in South Africa—in 1999. In 2015, I was the host and emcee for South African Tourism’s Ubuntu Awards Gala at the American Museum of Natural History in New York. The event celebrates the best of South Africa (“Ubuntu” is a South African term loosely meaning “human kindness”), and the event brought back fond memories for me: South Africa is where my husband and I had our first date. Tim and I had met four months earlier—in Germany, where he was living and working as photography director of the newspaper Stars and Stripes. I was based in New York City and had gone to Germany to speak at the paper’s editorial conference. After four months of emailing each other from different continents, Tim and I had to figure out how to see each other again. It wasn’t easy: Tim traveled constantly for work, as did I. In January 1999, when he was freezing in the Balkans photographing the Bosnian War and I was headed someplace warm and sunny—Cape Town—to speak at a conference, we decided to meet up in South Africa. Our first date turned into a week-long trip. We spent a glorious day driving around the Cape of Good Hope (#TBT photo above), another in Franschhoek enjoying the wine country, and another in the seaside resort of Hermanus. We chugged across the country in Rovos Rail’s vintage cars and ended up on safari in the Sabi Sand reserve—at one of the first Singita lodges, in a private bungalow with our own plunge pool. It was some date. Sixteen years and two children later, Tim and I keep trying to get back to South Africa. Someday it will happen. Meanwhile, I can live vicariously via the Ubuntu gala. * Julian Harrison. Read Julian’s Insider’s Guide to Cape Town and the nearby winelands and, for the best trip possible, reach out to him via his WendyPerrin.com trip-request form. * Nina Wennersten. Read Nina’s Insider’s Guide to South Africa Safaris and, for the best trip possible, reach out to her via her WendyPerrin.com trip-request form. If you are looking for a different type of help with South Africa, feel free to ask and I can send you to the right resource. American West and National Parks: Plan Your Trip! What a wonderful story! I hope you make it back to South Africa soon.